Minimalistic design that offers classic backless bench style seating that is ideal for enjoying the surroundings. Clean simple lines work with multitude of motifs and with the range of available colors – it’s sure to look great in your environment. 3/8" steel rebar sub-frame reinforces the concrete construction of	these benches, while the sheer natural weight makes them practically impervious to vandals. 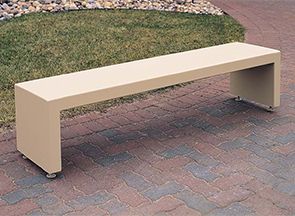 Do not place this product on any surface that will flex or move, these benches must be placed on a flat surface such as concrete.